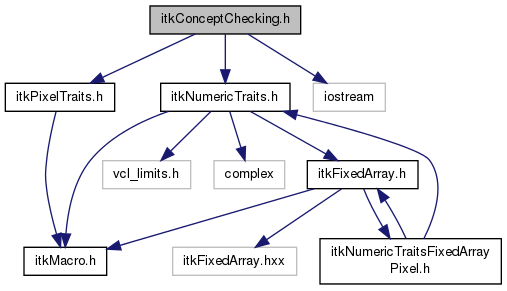 Choose a concept checking implementation based on compiler abilities. Definition at line 42 of file itkConceptChecking.h. Define the concept checking implementation chosen above. Standard instantiation-time concept check. No run-time overhead introduced. This implementation is based on "Concept Checking: Binding Parametric Polymorphism in C++" by Jeremy Siek and Andrew Lumsdaine, University of Notre Dame. Definition at line 59 of file itkConceptChecking.h. SphinxExamples/src/Core/Common/ConceptCheckingIsFloatingPoint/Code.cxx, SphinxExamples/src/Core/Common/ConceptCheckingIsSameDimension/Code.cxx, SphinxExamples/src/Core/Common/ConceptCheckingIsSameType/Code.cxx, and WikiExamples/Developer/ConceptChecking.cxx. Definition at line 63 of file itkConceptChecking.h.